The CFC Media Lab team headed to “Pitchburg” this month for the highly competitive AlphaLab Gear Hardware Cup International Finals in Pittsburgh. Joining them was Alexa Roeper, CEO and co-founder of Penta Medical, the winner of the inaugural Canadian Female Founders Hardware Cup and also competing for the US$50,000 grand prize investment, and IDEABOOST Cohort 6 IOT connected hardware company, Little Robot Friends, with its founder, Mark Argo. They encountered an impressive roster of international hardware startups that included Japan’s QD Laser’s retinal glasses, India’s EyeROV, an underwater drone, and the cheekily-named Vagenie, a modern Kegel fitness and tracking solution, which took the top prize. PlayDate, the world’s first pet camera in a smart ball, was named runner-up. Mark Argo of Little Robot Friends shared his valuable takeaways from 2017 Hardware Cup with us. Which companies and connections stood out? Mark Argo: I think the two best connections were not related to fundraising, but rather, to market expansion. I met a great delegation of folks from Japan, some of whom represented the hardware accelerator Makers Boot Camp. They recommended that we try to work together to bring Little Robot Friends to Japan, something I've always wanted to do. LRF was partially inspired by a Japanese toy company named Meywa Denki and I've always held their approach of blending art and tech as ideal. The other solid connection came from someone who worked with Virginia School Boards to bring coding and STEM into the classroom. We really connected over LRF's approach to introducing code through project- and problem-based learning. What advice would you give other founders participating in short speed-date-style meetings? Argo: I think the practise of doing rapid-fire pitches is actually quite clever. It forces you to boil your concept down to the bones, and depending on the person you're sitting across from, you slightly tweak your pitch to better communicate to their interests. But it also works the other way. By sitting down with so many different types of investors and interested parties, you get a sense of what type of person would make an ideal partner going forward. Some folks want to push you into the market as quickly as possible. Others understand the importance of being deliberate in each phase of growth to make sure you're building something strong. We're still learning about the different types of investors and approaches, so it’s very educational to cram it all together in an intense session like that. What about AlphaLab Gear’s community (and Pittsburgh!) resonated with your company? Argo: AlphaLab Gear appeared to have a great supportive community and one that borrows a bit from the energy and spirit of the big local university, Carnegie Mellon University. That environment of sharing, co-creation and learning is exactly what young startups need as they build their companies. The fact that they embrace hardware is also really great. We keep hearing: "hardware is hard.” Yes, but if that's the case, then "software is soft," and it’s important that our world isn't fully comprised of experiences behind a screen. They perhaps don't resonate or make as deep of an impression, especially with kids who are bombarded with all sorts of new information and stimuli. Mixing the "hard" and the "soft" is a huge challenge, but it's a challenge that we at Little Robot Friends have taken on with passion and excitement. 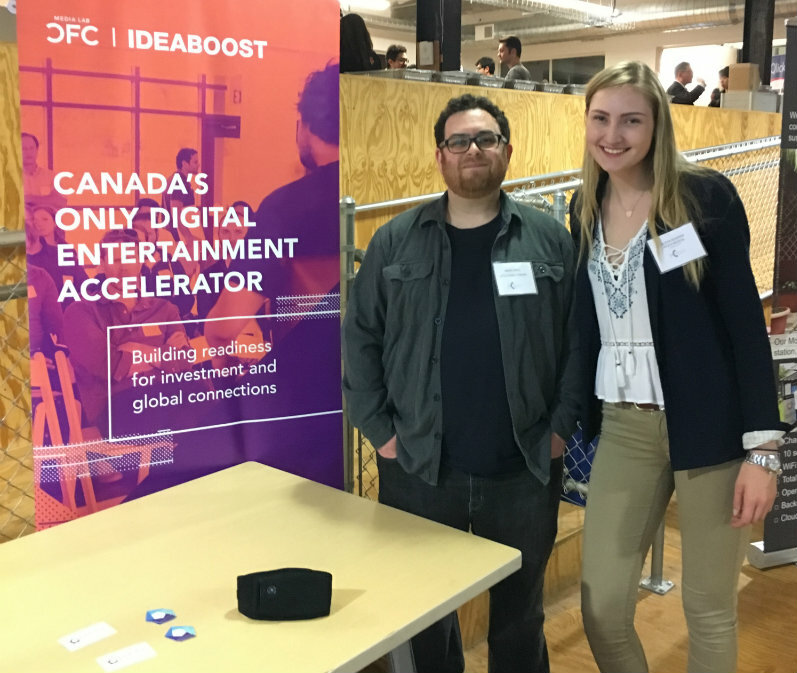 The Canadian Female Founders Hardware Cup was the brainchild of IDEABOOST’s Ana Serrano and We are Wearables Toronto’s (WWTO) Tom Emrich. It is the only pitch competition for female founders that feeds into the prestigious and highly competitive annual Hardware Cup in Pittsburgh, run by AlphaLab Gear’s Managing Director Ilana Diamond. Look out for next year’s announcement to get a chance at competing. Become part of the IDEABOOST Network Connect program to receive market immersion opportunities.